Last month, a tiny feathery head poked its way out of an egg in a nest on Mangawhai beach in northern New Zealand. 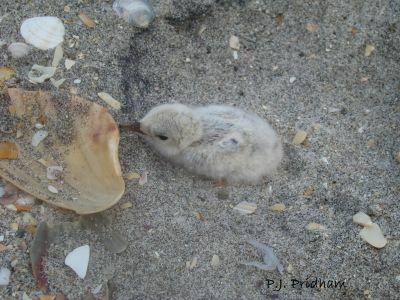 The newborn was a fairy tern, the first hatchling of the season – and it's among the world's rarest and most endangered birds. The entire subspecies, which breeds only in New Zealand, consists of about 40 individuals, so every new addition is precious. The birds have been protected in the country since the 1980s, when their numbers dropped nearly to single digits. These days, watchful wardens (including many volunteers) from the New Zealand Fairy Tern Charitable Trust (NZFTCT) and the Department of Conservation keep an eye on the eggs and chicks during the summer nesting season. 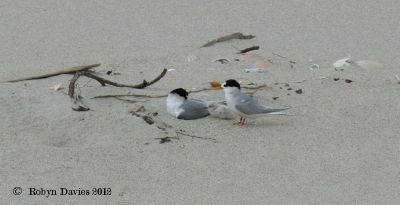 Known to locals as tara-iti, the terns scrape small nests in the beach sand, and their eggs take about three weeks to hatch. It's another three weeks before the hatchlings fledge, and the young birds are vulnerable to many dangers during that time. For the tern wardens, this means watching isn't always enough. So far this season, two nests have had to be moved out of harm's way on an Auckland beach. "The first nest was situated close to the site of search and rescue operations after the boating tragedy on the Kaipara Harbour," says Heather Rogan, spokesperson for the Trust. "The second nest … was at risk of inundation by the tide." All four of the eggs from those nests were moved to other beaches – Mangawhai, Te Arai and Waipu – where they replaced infertile eggs in the nests of foster parents. So far, two have hatched, though one chick was unfortunately lost. The other two, both at Waipu, are expected to hatch shortly. There's no shortage of dangers for these little birds, especially with humans around. Changes to their habitat and the presence of predators like cats and dogs can pose a risk. Unwary beachgoers can also be a problem: the eggs and chicks are well camouflaged against the shell-covered sand, and people have been to known to accidentally step on them. For local bird-lovers and conservationists, protecting the terns takes a range of tactics, from roping off nest sites and trapping small predators nearby to setting up sandbags to hold back incoming water. Educating beachgoers about the importance of their feathery neighbours is also key. The wardens are on hand to respond to emergencies. Besides the relocated eggs and first hatchling (who should be fledging soon), this season has seen two other eggs laid on Mangawhai, which will hopefully hatch soon. "So, if all goes well, there could possibly be six chicks this season – four at Mangawhai and two at Waipu," Rogan says. A lot of dedication has gone into insuring the success of these eggs, but six is only a small number. There are good and bad seasons – in the 2013-14 season, a record 12 chicks were reportedly reared, but the following year saw far fewer. As for this year, "I don't think you could call this a particularly good season," Rogan says. Fortunately, conservation-minded New Zealanders are ready to keep fighting for the terns, campaigning to save the birds' beaches, and even spending their holidays watching over vulnerable nests. Looks like New Zealand's traffic authorities will need to parrot-proof their road cones. 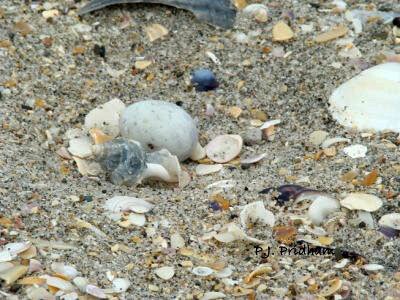 A very special egg has hatched at the Smithsonian Conservation Biology Institute in Virginia. Its occupant? A rare brown kiwi chick. The population of New Zealand's oddball "owl parrot", the kakapo, has been given a major boost with the addition of 33 newly hatched chicks.